Springbank "Local Barley" Cask Sample 14yo Sherry Barrel (N/A%): This is the first sample I pulled out of the envelope I received this week from Jens Fisher, creator of www.whisky-quiz.com and my classmate from Springbank Whisky School. The bottle is filled by himself in Warehouse No.15 at the distillery last June when we were there. The whisky is drawn from one of the legendary "Local Barley" casks. In different periods Springbank used locally sourced barley which became very famous especially the ones distilled in sixties. 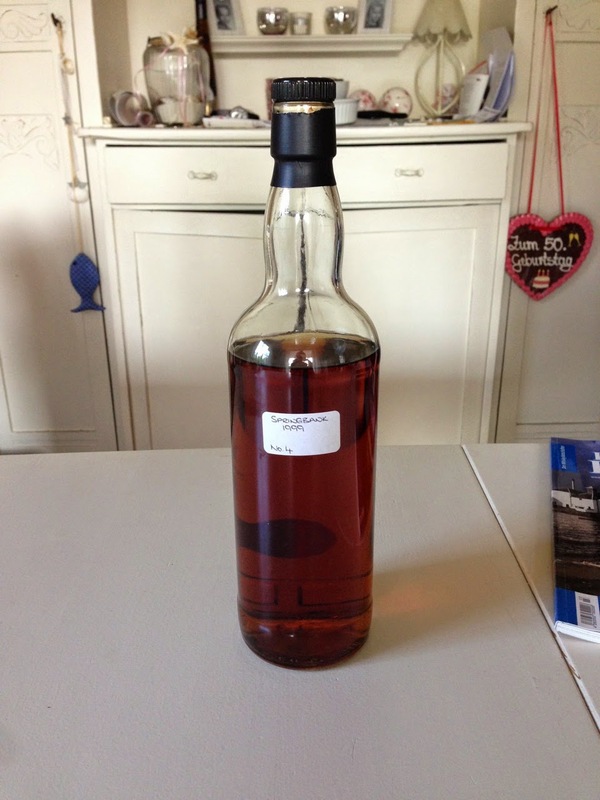 This one is distilled in 1999 and bottled like I mentioned above in June 2014. I don't have any info about its abv but obviously it is cask strength. Maybe he will have more info and post it in the comments box below. Color: Deep amber. Orange blossom honey with visible legs. Nose: Sour heavy cream, cooked prunes and dry raisin loaf cake. I can almost nose the sweet, sour, chewy, almost gooey Pedro Ximenez. Quite sulphury: somewhere between struck matches and thousand year old eggs. Adding water opens it up quite nicely. Sulphur level is down to unstruck matches now... Queen of puddings, Metaxa and Sauternes wine. Palate: Hot... Allspice, rum raisin ice cream and grape molasses. Quite a texture: chewy and thick. A generous amount of water helps to round the edges. Orange zest jam, ground cinnamon, roasted almonds and carrot cake. Hint of peat and marron glacé in thick syrup. Finish: Very long with sweet Greek baklava with cinnamon all over it, bitter almonds and creme caramel. Overall: It is a thick and bold whisky... A little too sweet for me but quite tasty. Would be a perfect dram for winter nights to sip after dinner with friends. I have to say one glass would last me the whole night though. Thanks again to my buddy Jens Fischer for sharing this sample with me. Danke vielmals Jens..!